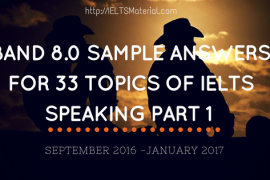 Check out the second part of Sample Answers for 33 New Topics of IELTS Speaking Part 1 (September-December 2016). 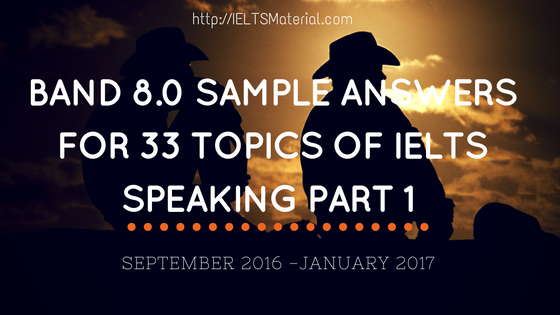 For Part 1/2, you can read at “Band 8.0 Sample Answers for 33 Topics of IELTS Speaking Part 1 (September-December 2016)- Part 1/2”. 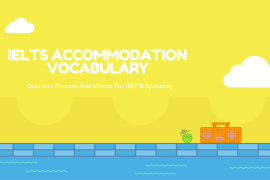 What kind of housing/accommodation do you live in? For the past 21 years I have lived in a house with my family. And I think if I can move out and start making a living on my own, I would try my best to afford a private house, since sharing a room or a flat with strangers sounds so troublesome to me. I live with my parents in our private house. Although during the time I studied abroad I already experienced living in a flat, but it ended up not so good so home sweet home, I think I’m okay with my house. I live with my family. There are 5 of us and we all have our own room, which is way more comfortable as the more older we grow, the more private we need for ourselves. I think our house is big enough for us yet still a warm and cozy place that I call home. Although during my childhood my family had to move a lot, I’ve lived in this most recent house for almost 10 years. Compare to the old houses, I think this house has been the best so far. The answer would be yes for my parents, since moving in and out is too time-consuming. Cleaning and arranging everything all over again would be like torture to them. Instead, as I’m thinking of moving out, hopefully soon I’ll be able to afford living in a flat or an apartment. What’s the difference between where you are living now and where you have lived in the past? As I’ve already mentioned my family moved several times when I was younger. And the most current house where we’ve been living for about 10 years is the best house so far. All of us have separate rooms for our needs of privacy yet a big dining room where we can spend the whole evenings together watching TV or having dinner. 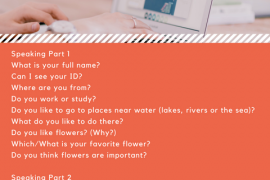 Can you describe the place where you live?/ Please describe the room you live in/ What parts of your home do you like the most? Briefly, my humble 4-floor house locates in a small and quite street, so coming home to me is like all the craziness happened outside is left behind. Just besides my house stands a big old tree. I have my own room with walls painted violet, which was exactly my favorite color. The air outside is fresh. I usually open the window to let the wind and sunshine in, which will help cooling down my room without air conditioner. Since I spend most of my time staying at home, my room means the whole world for me .It’s like a friend who is always there to share ups and downs with me day and night. So yeah, I would always miss my house, my room whenever I’m away. Which room does your family spend most of the time in? It’s the dining room where we spend most time together. We are a traditional family that while having dinner we watch the news and talk about our days. Endless stories have been told so we can help each other through hard times. Also we try to keep the family dinner as something we cannot go a day without, since for us it’s the family bonding that lies behind. What do you usually do in your house/flat/room? Well definitely I’ll spend some me-time there. I study, I chill with my hobbies such as reading, drawing and dancing all by myself. Sometimes I also invite one or two friends to spend time with. We’ll watch some movies together and tell each other endless stories. As I’ve already mentioned, my house locates in a quite neighborhood. After taking the bus I still need to walk for about 5 minutes more to get home. And I also come home quite late at around 6 pm so the traffic is not too crazy. Because I’d prefer staying at home so I spend my spare time for my hobbies. Usually I’ll start by turning on some music. If I have plenty of time, I’ll get straight to dancing or drawing. Otherwise, if it’s just a quick break, social network would definitely a good choice. Do you like outdoor activities? Sadly I must say no. Since getting outdoor involves choosing clothes, meeting people and sometimes standing the weather, so most of the times I’d prefer staying inside. If I’m free I can invite some friends to come over. We can still have fun without going out. What outdoor activities do you (most) like to do? The outdoor activity I like to do best is my photography tour, especially when the weather is perfectly fine. I would walk around campus to find inspiration. It could be a flower, a sunshine or the road I walk everyday. How often do you do that? For the past few weeks I’m too busy that I hardly have time to go on my photography tour. Previously I get outside three times a week and depending on the weather condition that I could go out more or less often than that. Definitely swimming, especially during the summer. Not only is swimming good for my health, it also helps me get in shape. Besides, I sometimes go jogging to enjoy fresh air. How much time do you spend outdoors every week? As I’ve already mentioned, I’m quite busy these days for any physical exercises. If going to the supermarket or go window-shopping are also considered as ‘getting outdoors’ then yeah, I guess I get outdoor once a week. How often do you do outdoor activities? I’m afraid not too often. I mean it’s not in my favor now. These days I’m so busy that most of the time I get outdoor is to go to school. Although I still hang out with friends, but basically we prefer having drink and a little chit chat instead of doing some sports. What (types of) outdoor activities are popular in your country? I think sports is particularly popular nowadays, as keeping fit is becoming more demanding. Or other street activities such as skateboarding, street-performing also are growing more and more popular among the young generation. Do you like painting or drawing? Drawing has always been a passion since I was a child. It was a good opportunity for me to have drawing a compulsory subject in my primary and secondary school. Although as a university student, I can’t spend hours on drawing, once I have inspiration, I would definitely manage my time to draw. Additionally, I’m not good at painting so I think drawing is fairly enough. How often do you visit art galleries? To tell you the truth, I have never visited art galleries before. Unless I have a guide to acknowledge me, art galleries would be quite boring for me. What kinds of things do you like to draw? My main inspiration are Japanese manga. The drawing topic is extremely varied, however only manga seems to show great potency for my level. I have a big collection at home and as I sometimes go through it again, I can see how much I’ve improved. Is it easy to learn how to draw? I think I must say it’s even challenging to a lot of people. I absolutely failed when it comes to drawing anything ‘real’ like people, trees and flowers. I think for those who succeed in drawing or arts in general, they first must have God-gifted taste of arts, then comes the long-term commitment that requires extreme practice and high patience. When do you spend time with your family? Since my parents go to work for a whole day, I and my younger brother has classes everyday, so we only meet to have dinner in the evening. Although we’re busy without own schedule, we tried to maintain the family-dinner habit as regularly as possible, so having dinner with my family has apparently become a habit. What do you usually do on weekends? What did you do last weekend? Weekends are my pamper days, if I don’t have to go to the supermarket to fill my fridge or meet my friends. Of course the first thing I’ll do every weekend is to oversleep as long as I could. Though I stay at home, weekend doesn’t get me away from work. However, I spend more time to chill out. I’d like to cook myself a big yummy meal and watch some TV while eating. The it’s time for hobbies. I’d probably practice dancing for a while or go online chatting with my friends a bit longer. And when the night comes after planning what to do next week, I’ll give myself some treatment and go to bed early. What do other people in your hometown (or in your country) usually do on weekend? As far as I’m concerned, people in my country have a number of things to do on weekends. They can go shopping. They can play sports or they can have drink with their friends at some nice coffee shops. Due to the weather condition, most people prefer getting outdoor during nightime. I don’t have any actual plan for weekends to be honest. If I’m free and the weather is nice, probably I’d have a drink and chit chat with my friends, since we don’t see each other often during weekdays. Otherwise I’ll just stay home, continue with my work and enjoy myself. Do you think it is important to make the most of your weekend? I absolutely agree with this idea. Weekend is a perfect time for revision and also planning ahead for the incoming week. Especially with final-year students, our weekends are no different from our weekdays except for classes. And I think we had better get familiar with it and try to make use of our weekends. Do you feel that weekends now are more important to you than when you were a child? Yes, weekends or day-offs are becoming more important to me. Since classes take away so much time that we barely have time for self-study or revision, not to mention taking care of ourselves. Back then I was of course more relaxed. There were no pressure, no deadlines and I have my parents take care of myself. Do you like sunny days? I definitely love sunny days, on which I can hang out with friends or do some sports. It is even better with the winds blowing. Sunny days are somehow helpful for laundry as well as cleaning both inside and outside the house. What do you like to do when it’s a sunny day? I’d love to go do some outdoor activities under the sun like meeting up with some friends or do some sports, especially swimming. Or I’ll grab the chance for a photography tour. Everything becomes so clear and stunning on sunny days, no matter it’s early in the morning or late in the afternoon, as long as the sun shines, I’m sure I’ll find inspiration almost everywhere in this university. Would you like to stay at home or go outside when the weather is great? I think I would say it depends on my mood and my workload. I definitely cannot go out enjoy myself if my work is still a mess, even though it was such nice weather. And unless I feel super energetic and motivated, I think most of the time I’d prefer staying inside, no matter how the sun shines or how cool the weather is. Are there many sunny days in your hometown? It is a big modern city so unless it’s our rainy season, otherwise the sun would shine most of the time, either during one day or during the whole year. Sometimes the temperature rises so high that it feels like burning, that’s when people prefer staying indoor enjoying the cool air produced by air conditioners. How do children celebrate birthdays in your country? To most children birthday is their biggest celebration, by which they have a birthday cake, a lot of friends and presents. Children in my country is no exception. The party can take place at home or even in class. Well since I was in the middle of my final exam week, I had no time to think about my birthday. I celebrated it once the exam was over. My friends cooked dinner for me and bought me some cakes. And friends from my hometown also sent me lots of wishes. I think that humble party was fairly enough for me. What kinds of birthday gifts do you like to receive? I think I’m fine with any kind of casual birthday presents like stuffed animals, flowers, accessories and cosmetics. It’s much appreciated as long as they can remember my birthday and give me wishes. Is there a difference between the way you celebrate your birthday in the past and in the present? There lies a big difference. When I was a child, I celebrated every year by a big party with my family and lots of friends. As I grow up, I tend to separate the celebration with my family from that with my friends. Do you often (like to) listen to music? Or Do you like listening to songs? So far I haven’t met anyone who dislike music. However, when the workload is too heavy that requires me to stay highly focus, music is a huge distractor. Unlike many people who likes listening to instrumental music because it highly benefits for their concentration and study, in my case the music makes me feel instantly sleepy. When do you listen to music? Well, music is essential to human in the whole world so I’m no exception. I usually listen to cheerful music when I need motivation while sad music is my go-to choice during emotional days. As I’ve mentioned I prefer working in silence, or to put it simple, no music is allowed during my working hours. After a long day at school, I probably want to chill for like half an hour with music to help me stay energetic so I can get back to work later. What kinds of music do you like to listen to? Or What’s your favorite kind of music? My music taste varied widely from West to East and from the 90s to modern EDM. But if Korean pop is considered as a kind of music, then yeah, that’s my favorite of all time. More than half of my playlists are Korean songs and I’m always keep myself updated with the news related to Korean showbiz. Have you ever been to a concert before? Or Have you ever been to a musical performance? It was like once in a lifetime, since in our country the ticket price for foreign artists’ concerts is so out of my reach that I can only stay home and watch online. It was 2014 that I finally did go to a concert on my own, obviously it was a Korean concert. It was absolutely mind-blowing and unforgettable for me. Do you like to listen to live music? Unless it’s live at a coffee shop, whereby literally only you and the music, then yeah I would love to go enjoy myself. But I would change my mind if it’s a concert. That place is too crowded and too messy that most of the case I end up having serious dizzy and headache. When did you start listening to this type of music? Since the day a friend of mine introduced her favorite group to me. She couldn’t help herself talking on and on about them that I thought I somehow needed to catch up with her. And the more I know about Korean pop, the more passionate I’ve become. Almost everywhere, except for classroom. It’s the golden era of mobility so everyone carries earphone and phone with them all the time, music therefore is on their fingertips. How do you feel when you listen to this music? Well I’m a type of person whose moods are easily affected by what I’m listening to, thus as the music changes, my mood also fluctuate. But most of the time listening to some music helps me relax and chill a bit. Have you ever learned to play a musical instrument? I learned to play the organ when I was in kindergarten. It was quite funny because I started out as one of the performers, then my teacher told my mom that I had better play the organ instead of performing, so I became her trainee and it continued for around 4 to 5 years until I was 10. Is music an important subject at school in your country? Music is one of the compulsory subjects for primary and secondary students. However, mainly singing is focused. We can also add some movements to make the songs more lively. Only those who are selected for the big performances can use musical instruments. Since my parents are music-lovers and they also have very good tastes, I was exposed to the old kinds of music at a very young age. Although I just can’t get the message at that time, my mom said that I was quite enjoyable. What kinds of music are (most) popular in your country? Besides pop music, the young generation nowadays expose to a number of different types of music. It is indeed difficult to tell which is the most popular, since from my point of view each type has roughly the same popularity. But I guess our pop music is the most popular. At least with the people I’ve met so far, all of them have listened or have known by heart a traditional song. Since my taste always changes, my favorite color at the moment is black. Although I just bought some black items recently, black surprisingly suit me. I become more mature and more mysterious wearing little black dress. And because it’s one of the basic color, it’s easy to be mixed and matched with other items of different colors and styles. What’s the most popular color in your country? To be honest, it’s hard to tell, as it totally depends on people’s taste. But I guess it’s my favorite color-black. Black fashion items can be found at clothing shops, since it’s said to be simple yet classy. And electronic devices and household supplies are mostly in black-colored, probably because it doesn’t show dirt and dust. Do you like to wear dark or bright colors? I’m actually flexible between dark and bright colors. But colors somehow do reflect my mood. Bright colors gives me a younger, positive and cheerful look. They also match my skin tone better than dark colors. So I guess I prefer wearing bright colors. What’s the different between men and women’s preference on colors? The difference in color taste can be seen so clearly that most menswear are more basic-colored while women clothes are varied vastly from monotone to color-mixed. In terms of fashion, the color theme for women is absolutely overweight. Do colors affect your mood? Actually the conversed effect is more suitable for me, especially when it comes to shopping. I’m actually not feel happier when I look at a pink-colored shirt or feel pulled-down when I wear a gray cardigan. So no, I don’t think color is not related. Do you like collect things made by hand? Collecting things are one of my hobbies, especially something old and memorable like stamps, photos, that sort of things. Handcraft actually is a compulsory subject in primary schools in my country. I think it’s aimed to teach student about patience and creativity. Are handcrafts popular in your country? Handcraft is extremely popular in my country, to tell you the truth. People are just crazy about making on their own accessories, key chains, jewelry, even beauty products. Some makers believe that their receiver will be so happy because they put their heart in their stuffs. Do you think children should learn more about handcrafts? I definitely think that children should be encouraged to learn more about handcraft. Although they’re not so good at it, they could learn to be more patient and creative. Moreover, handcraft can help develop their skillful hands. Do you think handcrafts are meaningful activities? They support intellectual development not only in children but also in a wide range of age. What’s the most popular means of transportation in your hometown? How often do you take buses? Almost every day in a week. Since my house is so far away from the university I go to that it’s impossible for me to travel by motorbike. In addition, the air is heavily polluted by exhaust fume and traffic jams always take place, especially during peak hour. Thus, I’d prefer to take the bus, to save time, save gasoline and avoid the pollution. Can you compare the advantages of planes and trains? Planes and trains regularly depart and arrive on time, during the rides. Plus, there are many convenient facilities serving particularly for certain groups of passengers. However, traveling by plane is clearly time-saving and enjoyable in terms of on-board servings like meals or comfortable seats, while traveling by train offer you a chance to see the world outside. It’s totally a great experience for most train-travelers. Is driving to work popular in your country? Although cars themselves and gasoline are expensive, a lot of people prefer driving, possibly because driving is more comfortable under such weather, with such polluted and noisy surroundings. Do you think people will drive more in the future? If you’re talking about my country, no, I don’t think it’s possible, even in the future time. Cars and gasoline are becoming unaffordable for many people these days. Plus, the traffic infrastructure in my country is not appropriate for cars. Would you ride bikes to work in the future? Definitely not. Riding a bike means you’re exposing yourself to the unpredictable weather and to air pollution. What is worse, I’m afraid the main streets or the highway are too dangerous for cyclists, as cars, motorbikes and buses will travel at a very high speed. Thus I’d rather ride motorbike or take the bus instead. What will become the most popular means of transportation in your country? I think buses will take the lead. You can travel long distance without much worries about ticket price or rainy weather outside. Also new buses now offer better services like comfortable seats for the elderly or good air conditioning systems. Do you prefer public transportation or private transportation? I think I’d prefer public transportation. It’s more inexpensive and because it can contain large number of people, it helps ease the intense of traffic jams during peak hours. Private transportation is more costly in terms of fees and gasoline. “I believe in the strength of passion when it comes to learning any languages. It is passion that urges you to uptake 50 new words everyday. 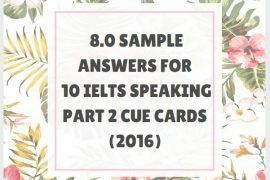 It is passion that motivates you to spend hours watching English news, listen to hundreds of English songs or read twenty English books in a month. Techniques and tricks are just for exams, the power of your passion is what transforms the language to become a part of you".